Isolation does strange things to people. Think about Jack Nicholson in The Shining or the UNAbomber. Leave a man all alone with nothing else but his thoughts and the wilderness and you’re bound to end up with your own little Apocalypse Now of one kind or another. But what if you could channel all that craziness and obsession into something constructive? Like, say… a motorbike. What do you think a man could achieve then? Whatever it would be, you can bet it’d be original, fast, and just a little bit crazy. My fellow Pipeburnians, meet Finnlandian Janne Leiman and his Jawa 500 from Mänttä, which roughly translates to “Twin Peaks” in English. No, really. My name is Janne Leiman, aged just over 40. I live in Mänttä, middle Finland. Little country town, about 6500 citizen. There is one big employer, paper mill, where I used work. I started JL Meccanica motorcycle garage about five years ago with my wife. I have, of course, build a lot of bikes before that, but then it became my only source of income. Couple years it was slower, but nowadays there is more project offered than we can take. Main part of jobs is classic race bikes, which we made replica frames, suspensions and body parts. Sometimes, in projects which we are deeply involved, engine works too. Supercharging of motorcycles are our other specialty. Can you take us through the build of the Jawa? Jawa is old bike, first version of it was build over ten years ago. 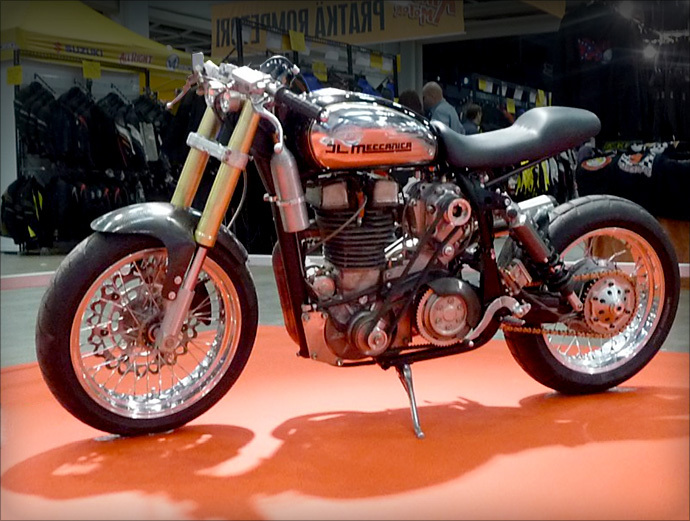 I think that I want classic Cafe Racer, but not usual Triton. Manx or G50 engines were bit out of budget, so looking for something else. One special motorcycle sport here in Finland is ice speedway, Russia is only country where is more iceracers than here. Engines for ice speedway are classic looking, because of air-cooling, and two valve heads (restricted by rules) and they are fast, over 60hp in 10000rpm. And very scary looking machines, but thats another story. I buy Type 891 engine one local rider, and convert it to use gasoline (they burn methanol in race use) by lower compression ratio from 15:1 to 9.5:1. This was made by machining piston dome, it was quite high… I have one left-over Volumex blower from earlier project, it was bit of used state, so excellent one to shorten. Volumex stock output ratio is 1200cc per revolution, but I machined lobes and case 32mm shorter to decrease it to 800cc./rev. Then underdrive it 1:1.35, totals boost pressure 0.9bar. Just right for race gasoline. BSA A10 gearbox is from Brit spares supply, stock gear ratios, but I removed half of engagement dogs for faster shifting. Or shifting at all, BSA box doesnt want to take next gear at 10000rpm. Carburettor is from local DellOrto dealer, new DHLB35, small version of more common DHLA, aimed for small engines. Intake and carb plates are machined from billet, as supercharger pulleys and engine plates and airhorns and so on. Clutch is from speedway Jawa, splines machined little to fit on BSA input shaft and primary belt drive made from industrial parts. Oil system was total-loss, not the most practical for street, so it converted more conventional type, oil tank is integrated in frame front tube. After searching pair of Marzocchi forks and WP rear shock, I start frame work. First shorten and re-valve shock (it was from KTM MX-bike), and mating it with Aprilia swingarm. Then, after calculating steering geometry, normal tube bending and welding job from 25CD4 tube. Rear frame and small section of left main frame tube made removable for easier service. Tank is from 60s Jawa streetbike, or its outer shell, tunnel is made more deep, because of much higher engine. I made fiberglass base for seat, and cover it black vinyl. First version was on casted wheels, but not for long. When I figured how I can make spoked hub for single-sided swingarm, it was time to order couple of Morad supermoto rims. Rear hub is Suzuki T250 front hub, inside machined flat, then welded in 15mm plate, and bored holes for drive pins. Brake plate is made from billet and fitted original Suzuki shoes and slave cylinder from WV Golf. Master cylinder is Magura item. Front hub from Kawasaki KX laced Morad rim and fitted custom made brake disc. Grimeca four piston caliper and Brembo front master cylinder. Electric is very simple, small alternator made from pair of Bosch moped magnetos and fitted on cranckcase behind motor belt pulley. Battery and regulator is between gearbox and swingarm spindle. Lightining consists two 12v sealed halogen bulbs in aluminuim turned shells and small trailer rear light. Iceracer ignition was seperate magneto without any advance curve, only need to use full throttle in that sport. Not so user friendly when you try to kick start engine, after three bended pedal, one broken shaft and one splitted sprocket I think it was time for change. So I machined case for Nippondenso pick-up and rotor with shaft in place of magneto, and fitted Ignitech pc-programmable ignition unit. Because of very limited output of alternator, and my attraction for old tech, nitrous system is totally manual operated. Nitrous valve is from fire extinguisher, fuel side from pneumatic valve, both on billet block. Operation is via cable operated lever below clutch lever. Jet block is old NOS Cheater, mounted in intake plate, and bottle is modified CO2 bottle. I think that manual systems havent been commercially available since 1970s, and back then they was mainly for car engines. One thing I want to do bike is change front brake big double sided twin leading shoe drum. But early Yamaha TZ unit is hard to find, and expensive like Hungarian replicas of it, and making one take very much time. So maybe I let it like it is. Have you entered the bike in any shows? 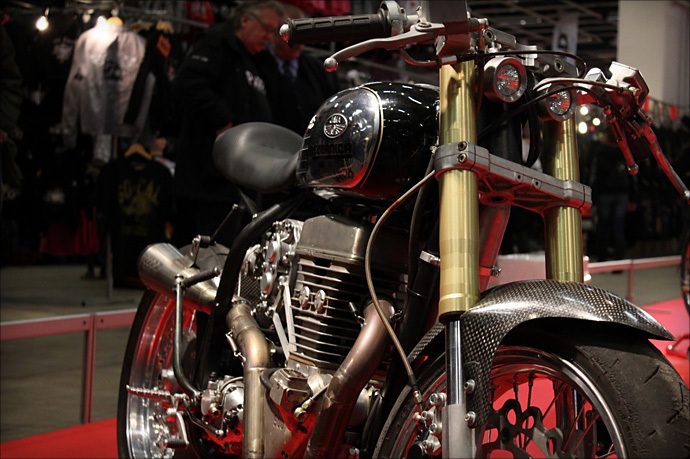 Jawa has been two times in Finlands main trade show, MP-show, invited by bike magazines, and couple local trade shows. 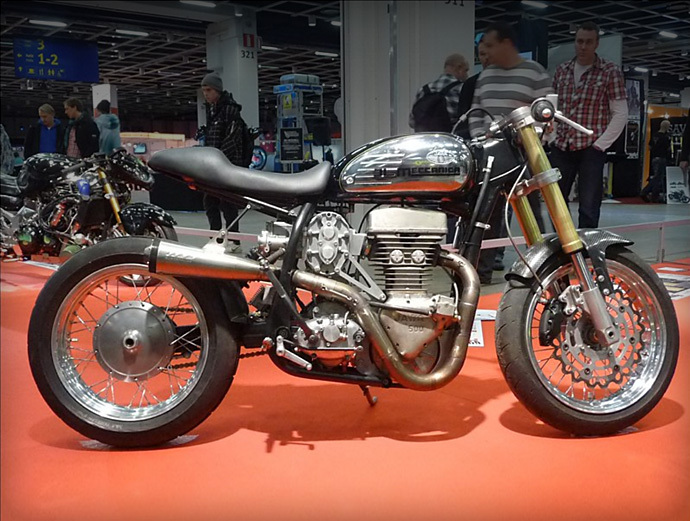 In 2008 it was in Finlands main event for custom bikes, Helsinki Bike Show, and won first price in street fighter class (there is no cafe-racer class) and Jurys choice. Probably no more shows for Jawa, time to build something new. As you seen above, it ground up building, but if you compare it usual standards, it is light, quite fast steering and, maybe suprising, user friendly. What’s the supercharger sound like? Charger pumping effect make engine idle uneven, and Volumex mechanical noice is quite loud. In higher revs most of other noices disappear under exhaust note, which is by the way, much louder than normally aspirated engine. Bike has never been in dyno, so I can only guesstimate power. It isnt faster than modern 600s, even lighter, so maybe 70hp without nitrous. Nitrous add 15hp, thats max what you can get with gravity fed fuel. If money was no issue, what woud be your ultimate custom bike? This is very difficult question. I want to make my own engine, or at least somekind of mix of existing engines, but other than that I really can’t answer. 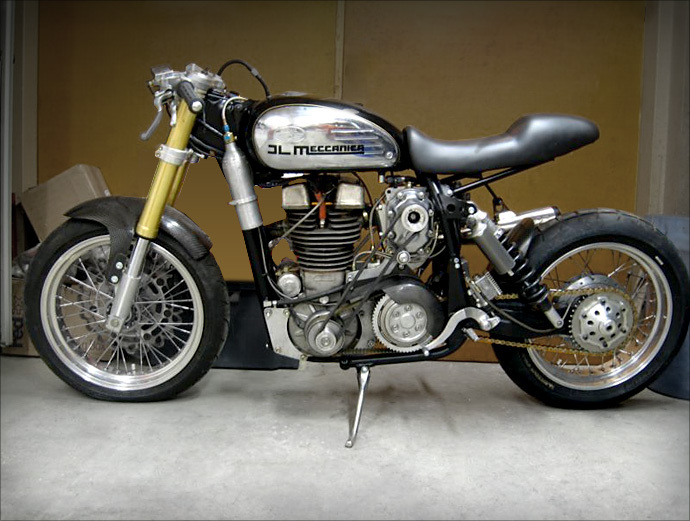 One already built bike which I really like is Stellan Egelands Hulster. What bike are you planning to customise next? Next bike project is started already. Its Ducati 8-valve 996 twin with Ogura supercharger. Frame I made from round aluminium tube, little like Spondon or GIA Engineering. It is on wheels, but finishing work take much time, and customers works are priority. If the bike had its own theme song, what would it be? I’m not really musical, but like Finnish punk music. Names of those so-called songs sound very strange, I spare you from that. How do you say “badass” in Suomi?